With warmer weather (and hopefully lots of sunshine) finally back in the Natural State, we are returning to our summer hours. Thursday - 10:00 a.m. to 6:00 p.m. The last tour will start 30 minutes before closing. If you would like more information, please call the museum at 501-371-8320. On May 23, 1939, while conducting routine training, the newly commissioned submarine USS Squalus (SS-192) suffered a catastrophic main induction valve failure and sank. The main induction valves are the valves that allow air into the submarine for the main diesel engines. When the submarine submerges, the diesel engines are turned off and the induction valves are closed. In 1920, the failure to close the main induction valve on submarine S-5 (SS-110) cause the submarine to sink. Fortunately, the crew was able to escape. Despite the many new safety features installed aboard submarines in the nearly 20 years following the S-5 accident, somehow, the main induction aboard Squalus failed, allowing the four compartments in the back of the submarine to flood, killing 26 men. The partially flooded submarine sank to the bottom, coming to rest in 240 feet of water, beyond the normal limits of the diving technology of the day. The crew deployed the submarine's forward Emergency Buoy and her exact location was quickly determined. Rescue ships arrived and 41 hours after the initial accident, the 32 men who survived the initial accident were rescued without further harm. Among the men stationed aboard Squalus was Torpedoman First Class Sherman Luther Shirley, a graduate of North Little Rock High School. Torpedoman Shirley was planning to marry a young lady he had met in the area and a fellow crewmember, Electrician's Mate Lloyd B. Maness, was to be his best man. Unfortunately, Torpedoman Shirley was among the 26 men killed. Thanks to the generosity of his family (who still live in the area), a number of photographs, including the one above, have been donated to AIMM and are often on display. Forty years ago, on 22 May 1968, the nuclear-powered attack submarine USS Scorpion (SSN-589) was lost with all hands in the Atlantic while returning from a deployment to the Mediterranean. Ninety-nine officers and crew lost their lives. The exact cause of the sinking will likely never be known for certain. There are several books about Scorpion's loss in the AIMM library. The Court of Inquiry report has been declassified and is available through the U.S. FOIA Site. Twenty four years ago today, on the afternoon of May 18th, 1985, John Anthony Walker, a retired U.S. Navy Warrant Officer and former enlisted radioman, was arrested by the FBI for spying for the Soviet Union. On that day, the FBI uncovered a spying operation, born out of pure greed, that had started in the 1960s and lasted nearly 20 years. It has been described as "the most damaging Soviet spy ring in history." In the early 1960s, BEFORE he began spying for the Russians, John Anthony Walker was assigned to USS Razorback. He would later serve on many different submarines. After being caught, John Walker agreed to cooperate with prosecutors and investigators in exchange for his son Micheal (who was also involved in spying, but only in a minor role) receiving a light sentence. Micheal also agreed to testify and after being convicted, was paroled in 2000 after serving 15 years in prison. John Anthony Walker was convicted and sentenced to life in prison. Jerry Whitworth, John Walker's partner in the spy ring was sentenced to 365 years in prison. John Walker will not be eligible for parole until 2015 at the earliest. He will have served 30 years of his life sentence at that time and will be 78 years old. There are several good books about John Walker in the AIMM reference library. (The above picture is NOT John Walker). In addition to adding things to see inside Razorback, we've also been working on adding new things to see on the website as well. AIMM has a small, but growing collection of submarine plaques. While space prevents us from displaying more than a few at a time (and we also need plaques to complete exhibits), we have put pictures of nearly every plaque in our collection on our website. Some of the plaques are very plain, others, like the USS Cutlass plaque shown above, are very colorful. The plaques are under "Multimedia", then under "Artifacts". The direct link to the plaques page is here. Thanks to the generosity of Captain Talbert, Razorback's last American Commanding Officer, we have been able to make Razorback look even more "lived in". His dress white hat is now on display inside the Captain's cabin. AIMM has been working with the U.S. Submarine Veteran's, Inc. (USSVI) to create electronic versions of all available back issues of their publication, The American Submariner. Originally titled The Submarine National Review, USSVI has published this magazine since the 1960s, usually on a quarterly basis. 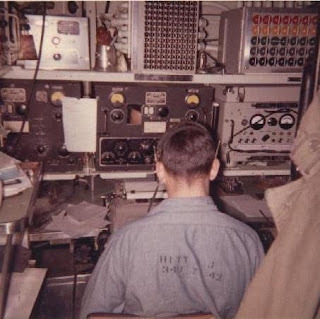 Each issue contains information about the organization's day-to-day operations, but they also contain a treasure trove of information about submarine history, including many personal stories not published elsewhere. 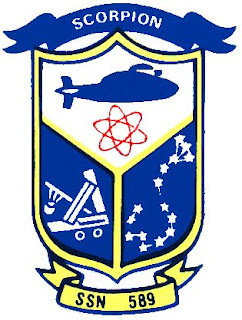 The electronic copies of each issue have been provided to USSVI and will be hosted on their website. Copies are also available, upon request, to museum patrons, or via e-mail request to the museum (gstitz@aimm.museum). AIMM would like to thank John Barr, Katelyn Abel, Andy Zonner and the other volunteers and staff who have put so many hours into this project. 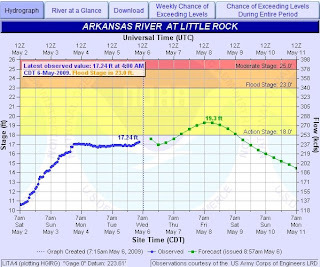 The Advanced Hydrological Prediction Service of the National Weather Service has revised its projections for the Arkansas River for the coming days. The river level, normally maintained at around 8-11 feet is currently at 17'. Due to the continuing rain (and forecasted rain), the river level is now expected to rise an additional 2 feet and remain high through the weekend. Therefore, the Arkansas Inland Maritime Museum will be closed this weekend. We plan to resume normal operations, including previously scheduled school tours, next week. For further information, please contact the museum at 501-371-8320. All U.S. Navy ships keep a deck log. This is an official, legal, record of all the vessel's activities, including changes in personnel (both new officers and sailors arriving and old crew departing); departure from, and arrival at, port; firing weapons (including serial numbers of torpedoes); and other activities. At the end of the year, the ship sends the signed deck logs to the Navy for storage. After a period of time, the deck logs are declassified and transferred to the National Archives in College Park, MD for researchers to examine. Some of Razorback's WWII deck logs have been scanned and are now on the AIMM website. Sometimes the entries are serious, such as when Captain's Mast is held. "1130 - The Captain held mast and assigned punishment as follows: ABLE, A.B., TM3c, AWOL 19 hours; Three weeks loss of liberty; BAKER, B.C., MoMM2c, AWOL 19 hours; Three weeks loss of liberty." "1600 - Received from Naval Ammunition Depot, Hingham, MA, 40 rounds 4" 50 cal common ammuntion SPDN 5802 FP; 60 round 4" 50 cal HC ammunition SPDN 5802 FP; 5040 20mm HEI, 2520 rounds 20mm HEI, 180 rounds 20mm BLP, 10,800 rounds .30 cal, 3600 rounds .45 cal ball; 50 rounds 12 gauge shotgun; 5000 rounds .22 call ball." Occaisonally, a bit of humor sneaks into the entry, intentional or not. "1905 - DOE, E.F., EM2c and DOE, G.H., BM2c, returned absent without leave; both men were under the influence of alcoholic beverage." Sometimes, the humor is intentional. On New Years Day, it is traditional that the officer on watch compose a poem for the very first entry of the year. In Pearl we lie in berth Sail Three. 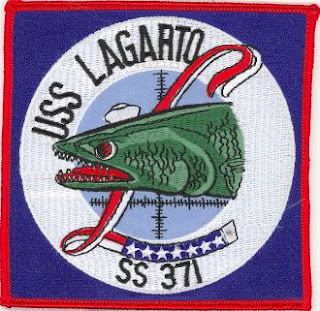 While on only her second combat patrol USS Lagarto (SS-371) was sunk with all hands by the Japanese minelayer Hatsutaka. The minelayer reported making a depth charge attack on a submerged submarine in 30 fathoms of water. In 2005, a group of private deep-sea divers discovered Lagarto's wreck in the Gulf of Thailand in 225 feet of water, well short of Lagarto's maximum diving depth. The divers found a large rupture in the submarine's hull, indicating that one of the Japanese depth charges exploded in very close proximity to the submarine. In 2006, U.S. Navy divers surveyed and photographed the wreck and confirmed her identity. The minelayer responsible for sinking Lagarto was in turn sunk by an American submarine, USS Hawksbill (SS-366) 12 days later. For more information about the discovery of USS Lagarto, please visit the website of the divers who discovered her in 2005.